In the old days, choices were fairly limited for who wanted to connect to the Internet: it was either a dedicated line (T1 and friends), or a modem connection. Dedicated lines are great but cost an arm and a leg, modems are cheap but slooow. The choice was easily made: companies got T1s, users modems. The arrival of Digital Subscriber Line (ADSL and its variants, SDSL, etc.) changed everything by blurring the boundary between professional and residential Internet access. Requiring only an ordinary copper pair, offering T1-like speeds, and priced for mere mortals, ADSL allows anyone willing to spend $40 a month to get connected to the Internet at high speed. Cheap broadband! But one obstacle remains: along with T1 lines usually came a full-blown router, expertly configured and maintained by the ISP who sold you Internet service. With DSL all you get is a flimsy little box, a DSL "modem" that can connect a single computer to the Internet – and it better be running Windows. In this article, we are going to replace that flimsy box with a proven, industrial-strength, open-source, free operating system: FreeBSD. Let's first look at two typical DSL installations. One uses an internal DSL "modem card" plugged directly into the DSL, the other an external "DSL modem". 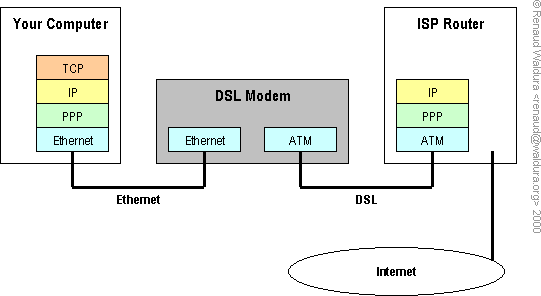 The latter is by far the most common and is shown in figure 1 (note that this figure is a simplification; the "ISP Router" box encompasses in reality multiple devices, commonly a DSLAM (DSL Access Multiplexer), a BAS (Broadband Access Server), and an IP router). That "DSL modem" acts as a bridge between your local Ethernet segment and the DSL itself. 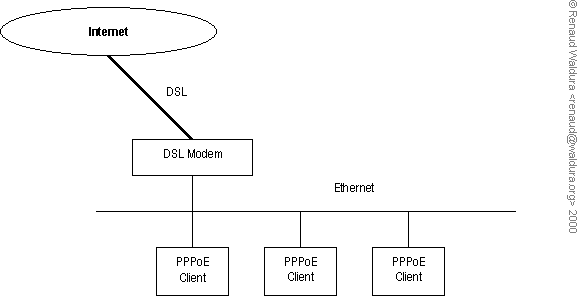 While the protocol running on the DSL is none of our business, you need to know that the communication between the modem and your computer uses PPP over Ethernet (Other protocols can be used also, e.g. PPTP, but this article deals only with PPPoE, by far the most common). 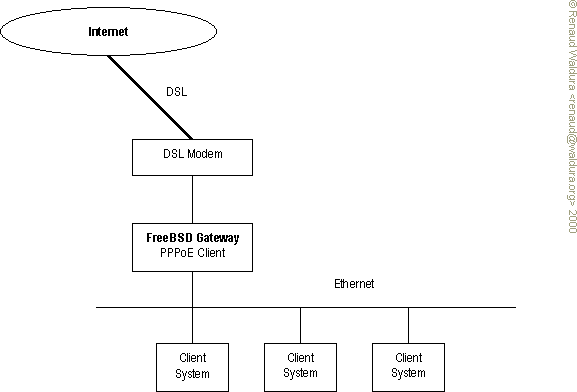 The goal of this article is to walk you through the steps involved in setting up a complete configuration allowing you to connect your FreeBSD computer to the Internet via DSL. We will also discuss how to setup that same machine as a gateway providing Internet access to a small internal network. Figure 1. A typical DSL installation. a working DSL line, i.e. activated by the provider selling you DSL service. some sort of device (sometimes called a modem, a bridge, or even a router) used to connect your computer to the DSL. a PPP account (authenticated with PAP or CHAP), also activated by the provider. at least one Ethernet NIC (adapter, card) in the machine. This interface will be designated eth0 from now on. This is not the case for the GENERIC kernel included in FreeBSD 4.0; you will have to rebuild a kernel in order to be able to use PPPoE. Please refer to the FreeBSD Handbook, section Configuring the FreeBSD Kernel for help in doing this. Okay, now let's do it. First make a backup copy of the existing /etc/ppp/ppp.conf file, then edit it to conform to example 1. Example 1. The ppp.conf configuration file. USERNAME and PASSWORD above should be replaced with your actual username and password, respectively. Also replace eth0 with your actual Ethernet interface. and you should be all set for the next step. We are going to make a first attempt at running ppp without authentication. This test will only verify your DSL configuration and will not create a working connection yet. See example 2. Example 2. A first run of ppp. Note how the first P of the ppp prompt becomes capitalized, indicating that the LCP phase was successfully completed. The next phase, authentication, fails, since you have not provided a username and password yet. If this first P fails to become capitalized, you need to look at /var/log/ppp.log and figure out what went wrong. Since debugging output was activated with set log +debug above, there should be lots of information there. Sift through the file and pinpoint the exact point of failure. I try to give some starting points in the Errors section below. You have completed the purposefully incomplete ppp run above, now you should be able to go all the way, get authenticated and connected. This is what we do in example 3. Example 3. A completed run of ppp. Note how the three "P" of the prompt are now capitalized, indicating that you have successfully completed the LCP phase (first P), you are successfully authenticated (second P), and your machine was assigned an IP address (third P). This constitutes the complete PPP connection process, and your machine is now online. Woo-hoo! PEER_ADDR above is the actual address of the next device in your network path, usually it is your ISP's router. LOCAL_ADDR is your actual IP address, the one assigned to your FreeBSD machine by the ISP. First you need to make sure that you can ping the PEER_ADDR. Failing this test would indicate serious trouble with your configuration, most probably DSL-related, in which case you will have to talk to your ISP to resolve them. This second test will have you ping a remote host by address, skipping DNS resolution entirely. Its goal is to check the network path beyond your DSL link. As I said earlier, any address assigned to eth0 is unused for the purpose of this connection; do not assign an address to eth0. This is a complete test that will also check your DNS settings. In order for ping to find the address for a.root-servers.net, your /etc/resolv.conf must be correct. In section 1. PPP Configuration above, we told ppp to get the proper DNS values from your provider with enable DNS. Unfortunately not all providers enable this, in which case you may have to create this file yourself. Of course, 10.1.1.1 and 10.1.1.2 above are to be replaced with the actual addresses given to you by your ISP. Once you have completed this test connection, you are ready to modify the system files to enable automatic connection when your FreeBSD machine is started. Edit /etc/rc.conf and add the lines in example 4. Example 4. The rc.conf configuration file. When in mode ddial, ppp will bring the link back up any time it is dropped. Even if you wish to have the machine permanently connected to the Internet, the PPP connection is bound to get dropped due to actions beyond your control; e.g. the ISP router might drop the connection. Using ppp_mode=ddial tells ppp to always re-connect as soon as possible; this will result in an infinite re-dialing loop if your service is shut down! to establish a long-lasting connection. PPPoE is capable of managing multiple concurrent PPP sessions on the same link: client machines can share the DSL by being connected to a common Ethernet segment that is plugged into the DSL modem. See figure 2. Although I have not personnally tried this setup, it seems like a fast and easy way to have many computers share the DSL. Of course your provider must allow it, and it offers no additional network security. Figure 2. Multisession PPPoE configuration. you do not have to get approval from your provider, a.k.a. having to pay extra for the same service. In fact, they will never even know you are running an internal network, which is often what you want. the gateway can easily be configured as a firewall, providing excellent security to the internal network. if the gateway is always powered up and keeps the DSL connection open, client machines get instant Internet access, without having to go through the PPP connection/authentication process. it can solve a real problem with Path MTU Discovery, discussed below. Figure 3. Configuration with PPPoE gateway. There are two ways of enabling this configuration: pay your ISP extra dollars for a business-type DSL service that gives you multiple static IP addresses, or implement example 5. Needless to say, the latter is cheaper, easily made more secure, and also more fun. Example 5. The rc.conf configuration file for a gateway. Although these are really the only mandatory changes, please refer to the FreeBSD Handbook, section Gateways & Routes for more information on setting up FreeBSD as a gateway. A potential problem with the last configuration (FreeBSD gateway with PPPoE clients) manifests itself in the following manner: client systems become unable to access certain Web sites. A Web browser stops in mid-download of pages, or does not access the site at all. Initially quite puzzling, it quickly becomes a major annoyance. I ran into the problem with various sites, netscape.com, wellsfargo.com and paypal.com. The sites are accessible from the gateway machine, but not from client systems located behind the gateway. A network trace with tcpdump does not show anything abnormal, apart from no packets making their way back to your system. Figure 4. A faulty network device drops ICMP messages required for PMTU. But let's explain what's going on. Your client systems implement Path MTU Discovery by sending TCP packets with the "Do not fragment" bit set and a large TCP Maximum Segment Size derived from the local MTU value (a complete description of Path MTU Discovery can be found in RFC 1191). Since your clients are connected to an Ethernet, their packets are sent with a MSS = MTU(Ethernet) - 40 = 1460. Unfortunately, because of the additional encapsulation, your PPPoE link has an MTU smaller than the Ethernet MTU. It is not an issue on the way up, from your client to the Web site, because the client is only sending a HTTP request, which typically fits inside one packet, smaller than the MTU. But on the way back down, the web site is sending large packets (the Web page, or the file, that was requested). 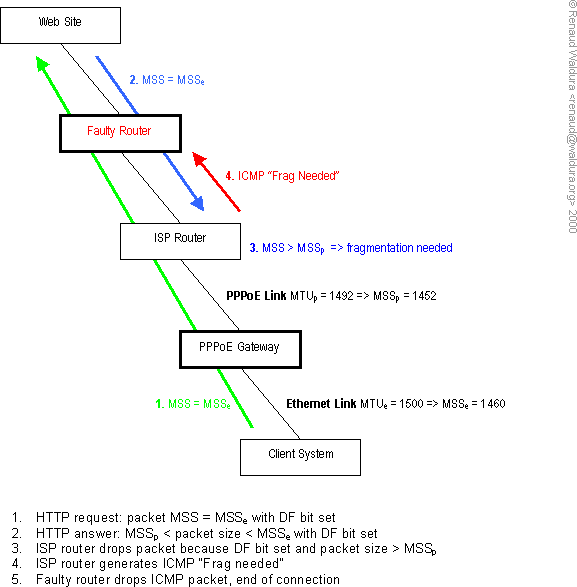 Whenever a data packet larger than the MTUp (see graph above) is received on the ISP router, it drops the packet (the router would fragment the packet, but it cannot because the "Do not fragment" bit is set) and sends a ICMP "Fragmentation needed" message back to the originator (the Web site), telling it to resend smaller packets. Unfortunately, if that ICMP message does not make it back to the originator of the packet, or is not generated by the router, the originating Web site will not resend those packets, and they will never be received by the client. Sometimes the problem is blocked ICMP traffic, sometimes it is a misconfigured ISP router that does not send ICMP "Frag needed" messages. The end result is the same: the client does not receive the Web page it requested. Why does this happen with PPPoE? Because your data packets are encapsulated into a PPP datagram, and then into an Ethernet frame, resulting in additional overhead; while most Internet links have at least 1500 bytes of MTU, your DSL link has less because of the encapsulation. It is worth emphasizing that this behavior is not a design error in any way: the problem really only stems from having misconfigured (or buggy) network devices in the path. I have heard that some DSL providers (e.g. UUNet) attack the problem at its root by contacting Web site owners and misconfigured ISPs. Since such a large scale approach is not suited to anyone but the largest network operators, I will explore in the following sections what you can do by yourself to solve this issue. See also the FreeBSD FAQ for another, shorter description of the problem. A fix is also offered, a change to the Windows registry to lower the client MTU; see table 1. String 1450 or 1492 change N to match your adapter. DWORD 1450 or 1492 change Adapter to match your adapter. DWORD 1448 - 1492 change interface to match the adapter. Table 1. MTU registry key for Windows. to your ppp.conf. And that's all you have to do! (no need to futz with the kernel configuration either). Of course the explanation of what's going on is still valid. Unfortunately the fix above needs to be applied to every single client system located behind your gateway. A better solution has been worked out by Patrick Bihan-Faou, Ruslan Ermilov and the freebsd-net gang: it involves running a very small daemon tcpmssd on your PPPoE gateway that corrects the TCP Maximum Segment Size of packets on the fly, setting it to the actual MTU size. It will also track MTU changes in case it gets re-negotiated by ppp. Figure 5 shows what happens with this patch. Compare with the broken case shown in figure 4. Figure 5. Tcpmssd corrects MSS of outgoing packets and prevents problem. The program tcpmssd.rc is a very simple wrapper for tcpmssd that we use to prevent cluttering the ppp configuration files. # Manage TCP MSS correction daemon "tcpmssd". DIVERT_RULE="divert $DIVERT_PORT tcp from any to any out xmit $INTERFACE setup"
The expression tcp & 2 != 0 shows SYN packets only. Note how the MSS of data packets is lowered from 1460 (the default value for Ethernet) to 1452 (the correct value for PPPoE). An 8-byte difference that changes everything. Your box is now connected to the Internet with a dynamic IP address, meaning that it will change every time you dial in. It's really nothing of a problem as long as you only want to get "out" to the Internet, i.e. for Web browsing, FTP downloads, etc. But it is a little bit of an annoyance if you are providing any services on that machine (running a HTTP server), or if you want to be able to access it remotely (through telnet or ssh). One solution is to pay for a static IP address, but that's too easy and not much fun. Another solution is to use a public DNS service, such as Granite Canyon Central Info, DynDNS.com, or DynDNS.org. As far as I know,, they all work just fine, but are entirely manual: every time your address changes, you have to go to the site's page, and manually update your name to address mapping. It quickly gets tiring. Another way is to use true Dynamic DNS, allowing a DNS server to be updated remotely, by program. For example, every time your connection is up, your DNS server would be updated automatically with your new address, ensuring that whatever name you gave your machine is always correct, points to the right address. I will explore the new features and possibilities of Dynamic DNS in a future article. Stay tuned! Your configuration file /etc/ppp/ppp.conf is wrong. Make sure you comment out or remove the set dial line. Also check your connections and cabling. missing kernel code: double-check your kernel configuration, do not forget to run make depend in the compilation directory. running with secure levels enabled: modify the security level, usually set in /etc/rc.conf and reboot; the security level cannot be lowered. See init(1). Udo Erdelhoff's excellent article about FreeBSD on ADSL with T-Online in Germany is somewhat more detailled and well worth reading – if you can read German that is. The FreeBSD FAQ has an answer to the MTU problem. The excellent ppp(8) manpage answers most questions about PPP and PPPoE, thanks to its developer Brian Somers. /etc/defaults/rc.conf for more ppp options. The FreeBSD Handbook and the FreeBSD FAQ. The DSL Forum General FAQs and Technical FAQs; two very interesting documents very worth reading if you wish to learn more about ADSL. 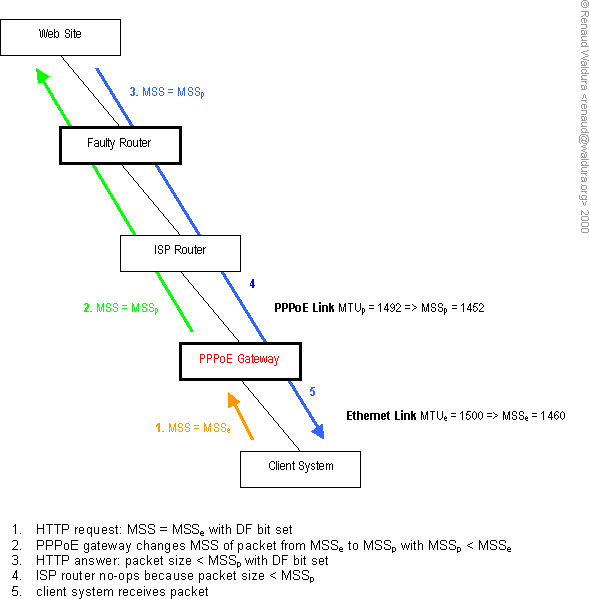 Marc Slemko's seminal article on Path MTU Discovery and Filtering ICMP. RFC 1191 - Path MTU Discovery. Q158474 - Windows TCP/IP Registry Entries. Windows 2000 TCP/IP Implementation Details. Renaud Waldura is a freelance consultant specializing in Internet applications. With a Master's in Software Engineering and 7 years of experience in the business, Renaud is able to tell a good piece of software when he sees one: FreeBSD is one of them. Visit Renaud's Web site at http://renaud.waldura.com/ to learn more about how he can help you with your business. Copyright © 2000-2002 Renaud Waldura. All rights reserved. Re-publication allowed by permission only.